Appropriately enough, the refurbished version of the Samsung Galaxy Note 7 is expected to be launched on July 7th. That works out to 7/7, a perfect date for the phablet to get another shot at life. The Galaxy Note 7 was recalled twice last year after units started exploding. An investigation conducted by Samsung blamed the batteries for the problem, which is why the cells used in the refurbished version of the unit have a reduced capacity of 3200mAh, compared to the 3500mAh batteries that powered the original model. 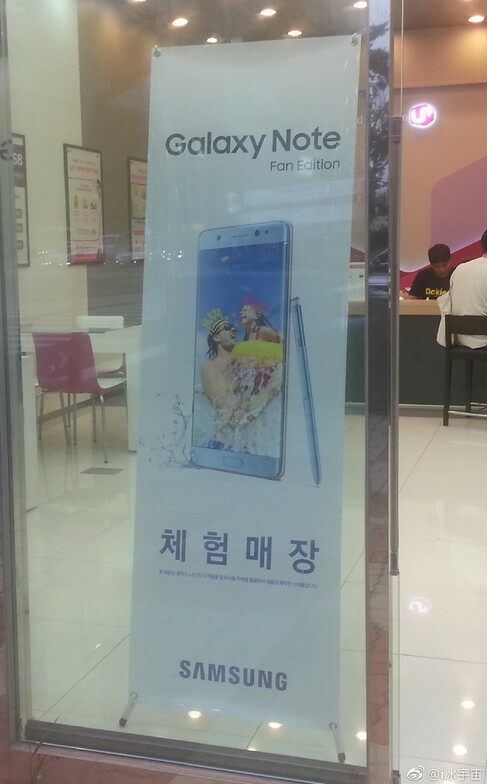 Today, a photograph showing a storefront poster heralding the upcoming launch of the Galaxy Note 7 (FE), was discovered on Weibo. We don't expect to see Samsung producing too many units with the Samsung Galaxy Note8 just a few months away from being introduced. That might also explain why the Note 7 (FE) won't be offered in the U.S.
Samsung reportedly took a huge multi-billion dollar hit financially when it finally took the Galaxy Note 7 off the shelves last year. In order to recoup a small amount of that money, the company decided to sell the refurbished Galaxy Note 7 (FE, which stands for Fan Edition). There were some Galaxy Note 7 owners who at first refused to send in their device when Samsung issued the recalls. That is how much the phone was loved by consumers. Had the batteries not failed, the Galaxy Note 7 might have been Samsung's best selling phone ever. Outside of the change in batteries, the Galaxy Note 7 (FE) will sport the same specs as the original model. Thus, the refurbished Galaxy Note 7 will feature a Gorilla Glass 5 protected 5.7-inch Super AMOLED display with a 1440 x 2560 resolution. Powering the phablet is the Exynos 8890 SoC with an octa-core CPU and the Mali-T880 MP12 GPU. 4GB of RAM is inside along with 64GB of native storage. The 12MP camera on back has an aperture of f/1.7, which is the same aperture found on the 5MP front-facing selfie snapper. Besides the fingerprint reader, an iris scanner is included. As far as pricing is concerned, speculation has the Galaxy Note 7 (FE) going on sale for the equivalent of $700 USD. THE GALAXY NOTE 7 FIRE EXPERIENCE: The old hag returns. With the S8 and S8+ out already and with the Note 8 coming in 3 months, I don't see a big need for this phone...other than Samsung getting rid of their stockpile. They could've went with anything other than FE, as we all know that the Fire Edition joke will come along with it once the phone is released. The only thing that will help this phone go off the shelves quickly is the pricing, and anything above $500 is too much for a refurbished last year's flagship. It's not necessarily refurbished though, what stops them from making new devices with the safer battery? Hey, Alan. The poster has Korean writing on it... So it's most likely in South Korea, not in China. PA; learn the difference between Chinese and Korean letters - and do your research. So for the price of a flagship phone, they are going to ripp Samsung fans off by selling them a year old phone that is famous for blowing up, 3 months before the successor comes along? Just to get rid of that stock pile eh. But wait that's right, only Apple ripps off people, Samsung is a saint.